College Football bowl season is here! 41 games, including the playoffs and the CFP National Championship start on Saturday. Accuscore has predictions for ALL bowl games, and we’ll start with Fresno State (11-2) against Arizona State (7-5) at Mitsubishi Motors Las Vegas Bowl. Fresno State is the only ranked team (No. 25) playing on opening day of the bowl season. They are a solid favorite with a 69% chance to beat Arizona State according to AccuScore. Fresno State’s sophomore RB Ronnie Rivers is projected for 53 rushing yards and a 48% chance of having at least 1 rushing TD. He has earned the number one running back role during the second part of the season and has recorder around 500 yards in his last 7 starts. In particular, Fresno State has relied heavily on their passing attack. QB Marcus McMariyon has completed 3,453 yards with 25 TDs and only 3 interceptions. Simulations project close to 250 passing yards for McMariyon on Saturday. Not a member? Membership includes ALL Sports! In the 31% of simulations where Arizona State wins, their QB Manny Wilkins averages 1.57 TD passes vs 0.3 interceptions, while in losses he has a ratio of 0.79 TDs to 0.49 interceptions. He hasn’t been able to put similar numbers as McMariyon or even replicate last season's statistics. The last two games, especially, against Oregon and Arizona haven’t been very good for him as the completion % dropped to 47% and 58% respectively. In 12 games of the season Arizona State RB Eno Benjamin has been able to gather over 1,500 rushing yards, but he may need to surpass his average per game so far for a win as simulations predict averages 125 rushing yards and 1.16 rushing TDs when Arizona State wins and 115 yards and 0.68 TDs in losses. Fresno State has a 26% chance of forcing more turnovers than they commit. Positive turnover margin helps them win 81% of the time. 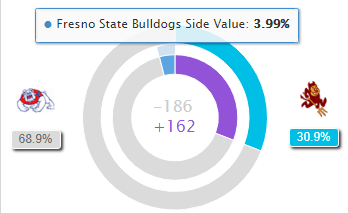 Based on Accuscore simulations Fresno State has 58% probability to cover -4 line set up by Vegas.